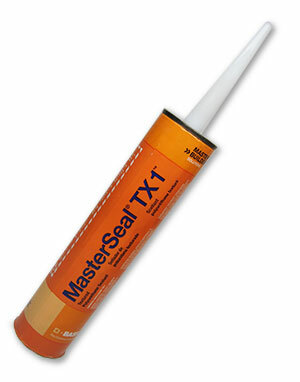 PRODUCT: MasterSeal TX1 Textured Caulking Sealant (formerly Sonolastic TX1), SPECIAL BRONZE Color (dark Bronze), 10.1 oz / 300mL Tubes. 30 Tubes/Case. Price/Case. Special order, shipping leadtime 1-3 weeks for less than 6 case orders. For 6 cases or more it can be drop shipped more quickly directly from the factory. DESCRIPTION: TX1 is the same product as NP1 but cures with a slight texture. Ideal for stucco & plaster repairs or grout replacement. Sonneborn polyurethane sealants are a one-component high-performance gun-grade moisture-curing polyurethane sealant designed for a wide range of sealing and caulking applications in active exterior joints. Sonneborn Polyurethane Sealant requires no mixing and typically bonds to many materials without a primer, including concrete and masonry and is ideal for horizontal and vertical joints, expansion joints, fascia, parapets and roofing.